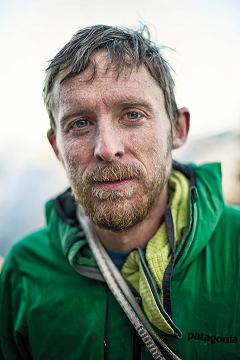 Tommy Caldwell started climbing soon after he learned to walk. Growing up with a mountain guide father, his talent and passion led him as a teenager to the top of climbing competitions and cutting-edge outdoor routes. In 2000, on a climbing expedition in Kyrgyzstan, Tommy and his climbing partners were captured and held hostage by armed rebels. Miraculously, after six days of captivity, the group managed to free themselves. Upon returning to the United States and trying to piece together his life, Tommy severed his index finger in a home remodeling accident. Managing to overcome the obstacles life was throwing at him, Tommy came back stronger and raised his already elite skill level and the sport’s standards. His subsequent free climbing accomplishments in Yosemite National Park remain unmatched and made Tommy one of the best rock climbers in the world, a perfect contender to be the first person to free climb The Dawn Wall. Like most kids, Kevin grew up climbing ladders, trees and fences, until a visit to his local climbing gym changed his life forever. Kevin steadily improved his climbing and started winning youth national championships. 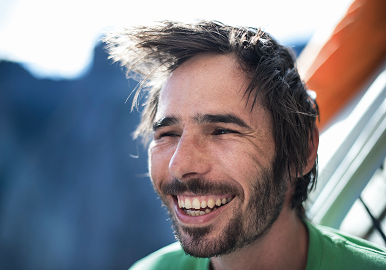 Once he discovered bouldering, he quickly made a name for himself as one of the sport’s best. At his home stomping grounds in the California’s Buttermilks, Kevin made the first ascent of the terrifying Ambrosia, a 15-meter high boulder from which a fall near the top would be catastrophic. While searching to expand into other climbing disciplines, Kevin learned about Tommy Caldwell’s initial forays on the Dawn Wall. Under the mentorship of Tommy, Kevin proved a quick study as he transformed himself into a big wall climber capable of the completing the most continuously difficult route in the world.